In Taxing the Rich is Good for the Economy Panderbear made the case that historically high marginal income tax rates do not lead to economic downturns, but lowering them sometimes do. The following chart from the Center for American Progress based on Bureau of Economic Analysis and Tax Policy Center data reinforces Panderbear's earlier thesis. It shows quite clearly that since 1950 high marginal income tax rates have been correlated with high annual growth in real gross domestic product. 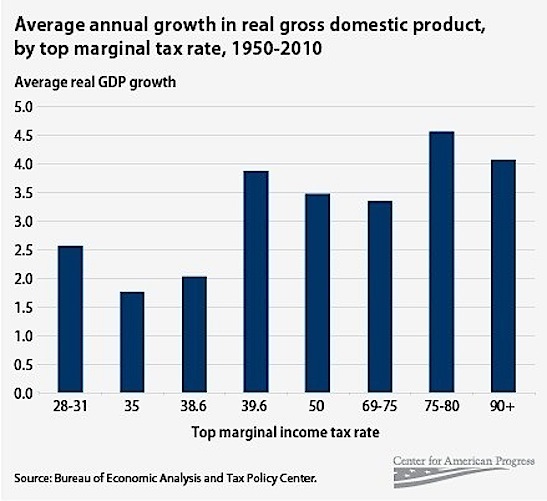 Panderbear concludes from this data that while increasing the top marginal income tax rates may not cause higher GDP growth, it certainly does not hurt it. Republicans arguing that taxing the so-called 'job creators' at higher rates will hurt the economy do not have a historical leg to stand on. Thank you, Panderbear. I follow Jack Webb's motto: "Just the facts, ma'am". Please continue with more facts to counter the Republican's fiction. The average American doesn't know who is right--and appears to parrot the loudest and most consistent voice, which usually is the Republican rant. Guess the old saw "the squeaky wheel gets oiled" is, unfortunately, true.